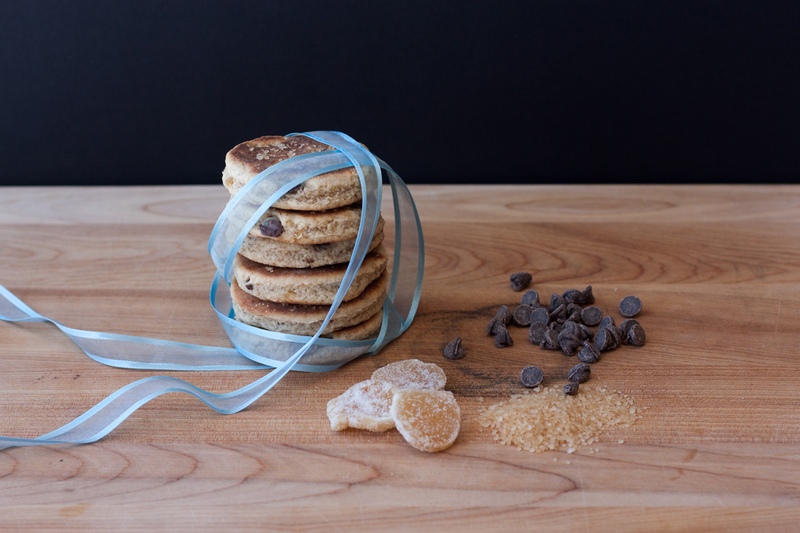 I absolutely love Welsh Cakes: their delicate taste and subtle sweetness. 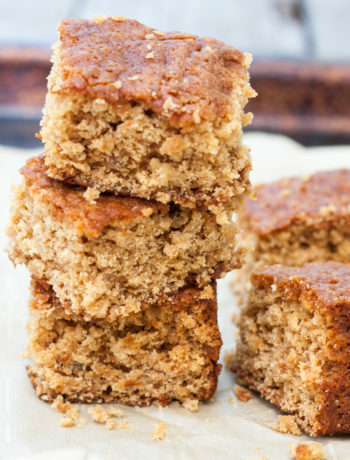 They are the perfect treat to have with tea or coffee. The first time I ever had them was many years ago during my first visit to Wales with my friend Bonnie during our year long adventure. We visited Bonnie’s Aunts, The Bettys (they were both named Betty) who lived in a small village near Swansea on a hilly street (though maybe that’s a given in Wales….I remember all of the streets being hilly) lined with row houses – each one a different colour. The Bettys put out a proper tea for us everyday around 4 pm. A table laden with cheese and crackers, cakes, bread and butter, fruit and devonshire cream, tea and of course, welsh cakes. I had never had welsh cakes before, but during our stay, I just couldn’t get enough of them. Welsh cakes are a cross between a scone and a cookie but cooked like a pancake in a hot skillet on top of the stove and are divine. They are slightly crisp on the outside but tender and crumbly inside. 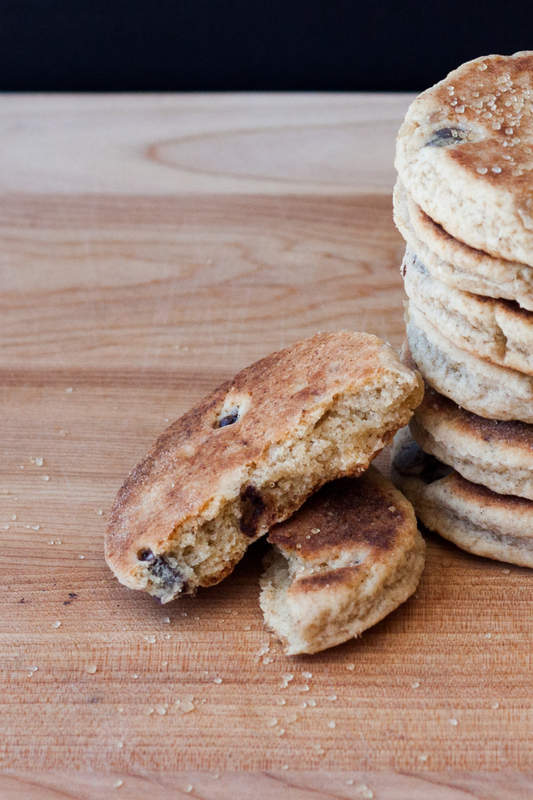 Welsh Cakes are made with flour, baking powder, sugar, butter, egg, milk. The traditional cakes are loaded with currants and sprinkled with sugar and are subtly sweet and delicate. 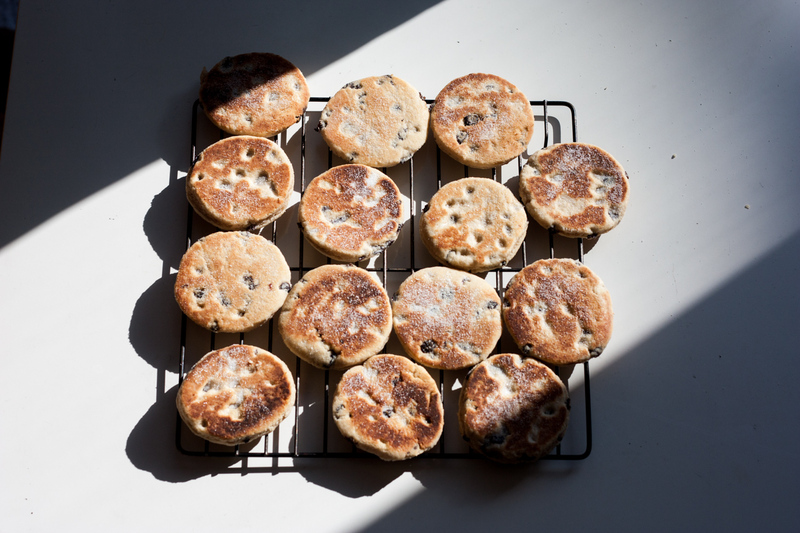 Welsh cakes (or pice ar y maen – cakes on the stone, in welsh) are so fast to whip up. They take, at the most, an hour from start to finish. 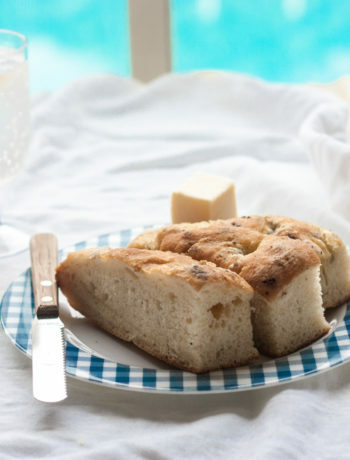 They are fantastic for the beginner baker as they are so simple to make. And they have ‘homemade’ written all over them, as I can’t imagine too many bakeshops spending time cooking these up on a stovetop individually. They taste best the day they are made or the day after. If you don’t think you will eat them all up within the first 24 hours, you could cut some out and freeze them uncooked until you are ready to cook some more. I always make Traditional Welsh Cakes with currants and white sugar sprinkled on top, but this time I tried a new variation with dark chocolate and chopped crystallized ginger with demerara sugar sprinkled over the cakes when they were still warm. Eaten warm from the skillet, the dark chocolate inside is slightly molten and the ginger is soft and lightly scented. My family loved both. 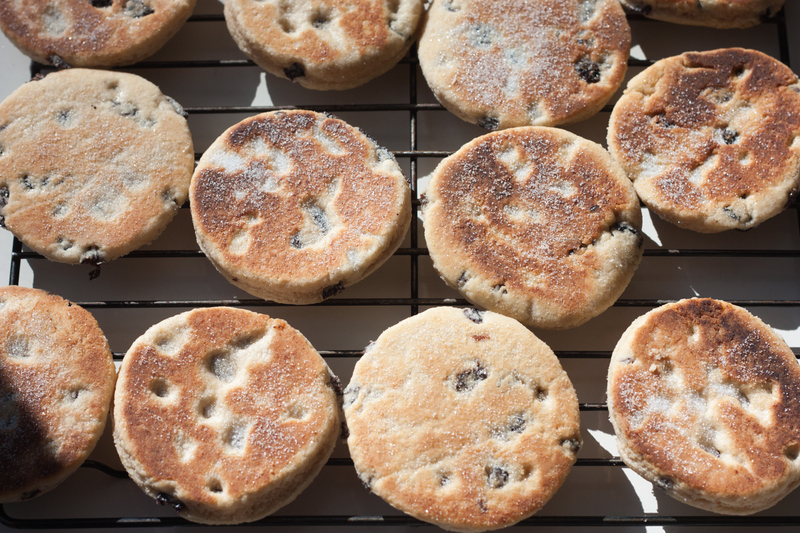 Welsh cakes were originally baked for miners to carry in their pockets down into the mines. A hearty snack and a taste of home while they were working in the cold, dark mines down below. Try popping one into a loved ones lunch to brighten their day. Here are a few variations that are made around Wales as well as in other places. Jam Split: Popular in South Wales, the cakes are split open and spread with jam inside. Apple Dragon: Add some grated apple to the mixture to make your cakes more moist. The Newport Lovely: These are made by the men of Newport for their girlfriends as a wedding gift or engagement gift. Mynydd Cymreig (Welsh Mountain): These are made in North Wales with two times the amount of baking powder in them, for loftier cakes. The Kiwi Cake: Welsh cakes have been made in New Zealand for many years, they just call them Kiwi Cakes. If you try a different variation, let me know. Enjoy! 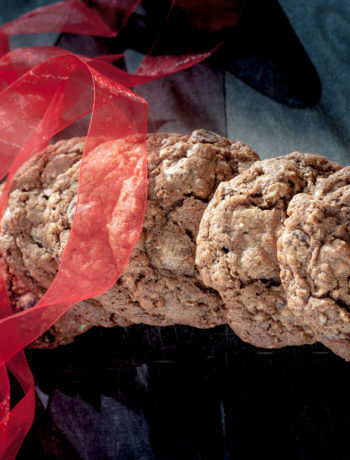 Stir in sugar and ginger and chocolate chips. Add coffee until a nice soft dough is formed. Roll out on a tabletop sprinkled with flour. 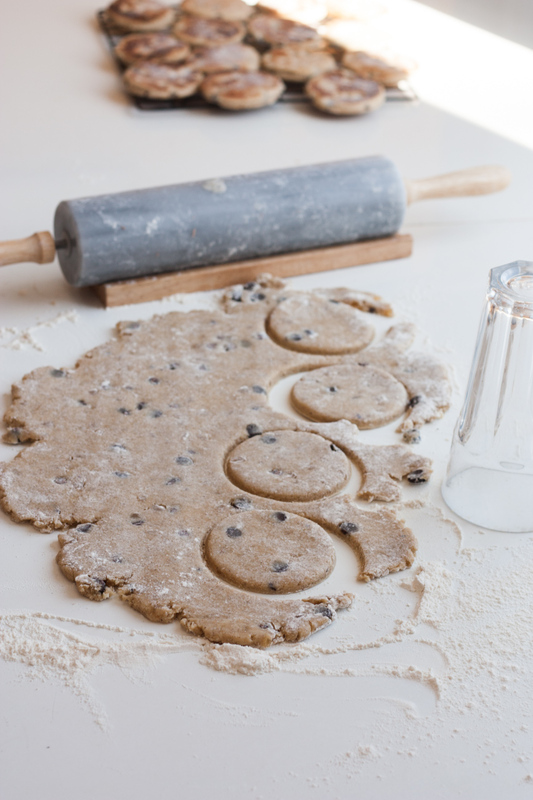 Cut out welsh cakes with any round shape approximately 7.5 to 8 cm in diameter. I used a drinking glass. Heat a skillet on the stovetop on medium heat. Add a very tiny amount of butter. Place a few welsh cakes in pan, with some space surrounding each one. Do not overfill skillet. You need room to flip them over. When the underside is a nice golden colour, flip over and cook the other side. Remove from skillet when both sides are done. If you want to freeze some welsh cakes for later, you can either freeze some cooked welsh cakes in a ziplock bag. Or you can cut them out and freeze the uncooked cakes. 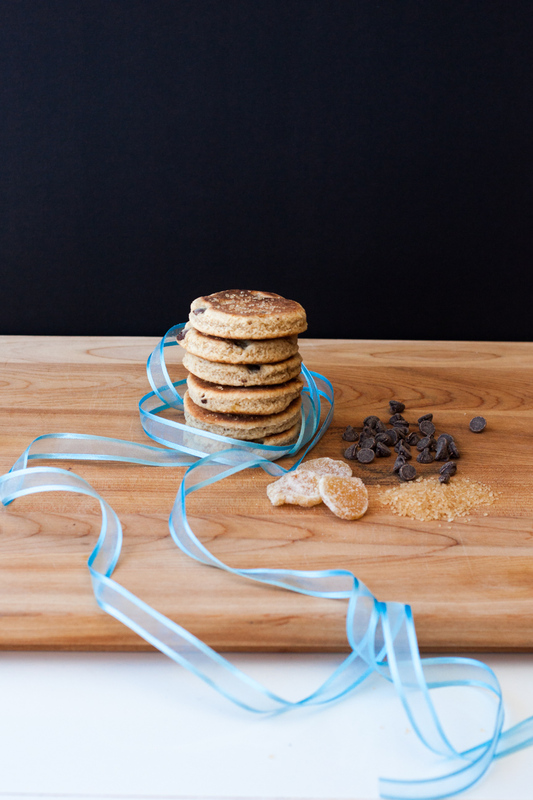 To do this, cut out the welsh cakes, place them on parchment paper on a tray and freeze until firm. Then place them in a ziplock bag or plastic container, layered with parchment paper in between. To cook, simply defrost the cakes and then cook following the instructions above.